Jon Sung Hun (Cho’n Su’ng-hun) is the former Chairman of the North Hamgyo’ng Workers’ Party of Korea [WPK] Provincial Committee and a former Member of the WPK Central Committee. He is a deputy (delegate) to the 13th Supreme People’s Assembly. 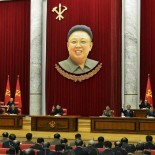 He has previously held positions in the DPRK Cabinet. Jon’s career began in the trading DPRK’s metal industries. His first significant position was as a principal of the state-owned enterprise Ferrous Metals Trade Company (also known as the Ferrous Metals Import-Export Company), serving as a director-general from 1993 to 1995, then as company president from 1995 to 1998. In April 1998 he was appointed Vice Minister of Metal and Machine Building Industries. Jon was elected a deputy (delegate) to the Supreme People’s Assembly [SPA] and at the first session of the 10th SPA during September 1998 was promoted to Minister of Metal and Machine Building Industries. the country’s early 2000s economic and academic outreach efforts in western Europe following the establishment of formal diplomatic relations. In this case, the DPRK and Italy had normalized diplomatic relations in January 2000 and signed a trade agreement in September 2000.
on a goodwill visit to Cuba and met with then-Cuban leader Fidel Castro. congratulatory event on Youth Day in August 2006 and his next observed appearance was not until December 22 the same year when he attended a central report meeting commemorating late DPRK leader Kim Jong Il’s election as Korean People’s Army [KPA] Supreme Commander. Jon presided over a meeting and DPRK Cabinet inspection tour of industrial upgrades at the Ch’o’llima Steel Complex in August 2007 where he read a congratulatory message from the WPK Central Committee. in the West (Yellow) Sea with Jon and the delegation returnng to the DPRK on December 6.
favor for two years. He was rehabilitated and appointed to his old position of Minister of Metal Industry in November 2011. We will strengthen the cabinet system and cabinet-centered system; adhere to socialist principles in economic work; and put strength into increasing production to the maximum by increasing the responsibility and role of the working people, who are in charge of production and construction. press ahead with the work, once it is begun, and see it through to the end. out operation and command in an ambitious and militant manner. We harden our resolve once again to actively contribute toward making my country and my fatherland wealthier and more powerful by deeply cherishing in our hearts the great honor and pride of greeting today’s great joyous event and loyally upholding the leadership of the respected and beloved Marshal Kim Jong Un. In April 2014, Jon Sung Hun was appointed Chief Secretary of the North Hamgyo’ng WPK Provincial Committee, replacing O Su Yong who migrated to the central party. The motivation behind Jon’s appointment as North Hamgyo’ng’s regional party boss was due to his experience interacting with foreign leadership and his career spent in the metal industries. His tenure in North Hamgyo’ng was marked by industrial upgrades at the Kim Ch’aek Iron and Steel Complex and managing staggered production schedules and output at the Musan Mine and Songjin Steel Complex. In May 2016, Jon was elected a member of the WPK Central Committee. He was removed from office as Chairman of the North Hamgyo’ng WPK Provincial Committee in 2017. Jon Sung Hun was born in 1951.